Thomas Stephen Luxton was born in Yeovil in Yeovil in 1884. The first record I managed to locate him in was the 1901 census in which seventeen-year old Thomas was listed living with his widowed mother Caroline and older sister Bessie at 19 Market Street. Bessie and her mother were both listed as leather glovers while Thomas gave his occupation as gunsmith - he was working just around the corner from his home in the shop of Henry Little of Silver Street. In the 1911 census the small family were still living at 19 Market Street. Henry Little the gunsmith having retired and given up his shop, 26-year old Thomas was now employed as a domestic gardener. He later worked as a packing assistant in the Publishing Department of the Western Gazette as well as being an agent for the Western Gazette in Preston Plucknett and Montacute. Probably in late 1914 Thomas enlisted in the Army at Taunton and became a Private (Serial No 241858) in 1st/5th Battalion, Somerset Light Infantry. He was to serve two years in India before going to Palestine with the Battalion. The 1st/5th Battalion was a Territorial Battalion formed on 4 August 1914 at the County Territorial Hall, Taunton as part of the South-Western Brigade, Wessex Division. It was initially stationed at Plymouth for a few days and then proceeded to Salisbury Plain. On 9 October 1914 the Battalion sailed from Southampton and arrived at Bombay, India, on 9 November 1914. The battalion remained at Jubbulpore until December, when it proceeded to Ambala. Strenuous training began almost immediately and continued almost for the next year. In May 1916 a large draft of nine officers and 449 other ranks arrived from England and the battalion was temporarily divided during the ensuing hot weather with some companies going to Chakrata and the remainder to Meerut. The following months were mainly occupied in training the draft but even in the hills little was done beyond this owing to the exceptionally wet season. The Battalion was reunited in October at Meerut. On 26 April 1917 17 officers and 838 other ranks of the Battalion, including Percy, sailed on HMT Chakdara from Bombay, landing at Suez, Egypt, on 11 May 1917, becoming part of 233rd Brigade, 75th Division - part of the Egyptian Expeditionary Force in Palestine. The Regimental History of the Somerset Light Infantry records "Several weeks training at El Arish and Rafa, where long route marches through the burning desert fitted the Battalion for the part it was to play in the near future.... The remainder of September was uneventful. The Regimental History of the Somerset Light Infantry records the detail of the Action of El Mughar and the part played in it by the 1st/5th Somersets, including Private Thomas Luxton - "On the 12th the Battalion moved forward and occupied a ridge south of El Kustineh and El Turmus, digging in and remaining in the position during the night of 12th/13th. The task allotted to the 233rd Infantry Brigade in the attack to take place on the 13th November was the capture of Tel El Turmus - El Kustineh (both inclusive) with El Mesmiyeh as a further objective. In phase one the 1/5th Somersets were to attack Tel El Turmus, and the 1/4th Wilts Regt. Kustineh, both Battalions attacking El Mesmiyeh as a further objective.... At dawn on the 13th the Brigade was ready formed up for the attack, the 1/5th Somersets on the right and the 1/4th Wilts on the left, with the 3/3rd Gurkhas guarding the left of the Brigade and the 2/4th Hants in Brigade Reserve. The Somersets disposed No 1 and No 4 Companies in the front line with No 3 in support and No 2 in reserve. By 6:50am patrols of the Somersets and Wilts had reported Turmus and Kustineh clear of the enemy, and at 8am the leading waves of both Battalions advanced to occupy the two villages and re-form north-east of the latter ready for the attack on El Mesmiyeh. In moving through Turmus the 1/5th came under shell fire, but no casualties resulted and by 9:15am the Battalion had formed up north-east of the village, as ordered, ready for the next phase of the attack. Kustineh had similarly fallen into the hands of the Wilts Regt., the latter forming up for the next stage of the operations on the left of the Somerset men. Of the latter Battalion No 3 and No 2 Companies now formed the front line with No 1 in support and No 4 in reserve. At 10:15am the attack on El Mesmiyeh began. About 1,200 yards from the village the 1/5th Somersets first came under very heavy shell fire and ultimately, as the Battalion approached its objective, violent rifle and machine-gun fire principally from the right flank. But with great steadiness the Somerset men kept on and El Mesmiyeh was stormed and captured "with great dash and gallantry". The village had fallen by 10:55am, but it took another half hour to clear the cactus-hedges and gardens of Turkish snipers who had concealed themselves cleverly. But eventually the last remaining Turk had either been shot down or sent scuttling back to the main body of the enemy, who had taken up position on the ridge running approximately east and west, about 1,000 - 1,200 yards north of El Mesmiyeh. A counter-attack on the latter was beaten off, but the Turkish guns continued to shell the village heavily while the enemy's rifle and machine-gun bullets tore through the cactus hedges behind which the British troops were lying awaiting further orders. The 3/3rd Gurkhas were now moved up into the village to strengthen the position. At 3:45pm Brigade Headquarters ordered the 1/5th Somersets and 1/4 Wilts to attack and occupy the ridge north of El Mesmiyeh. For this attack No 3 and No 1 Companies of the 1/5th Somersets were lent to the Wilts.... This attack was again completely successful, the Somerset men and the Wilts attacking the ridge with great determination. They dislodged the enemy who fled in full retreat, the Somerset men capturing three machine guns after killing practically all the crews of the guns. The Wilts took many prisoners. No 2 and No 4 Companies of the Somersets guarded the right flank of the attack which was still under heavy machine-gun fire." Casualties suffered by the 1st/5th Battalion of the Somerset Light Infantry during the fighting on 13 November 1917 were one officer and five other ranks killed and two officers and 41 other ranks wounded. Following the battle, the 1st/5th Somersets, together with the rest of the Brigade, concentrated on the Jerusalem Road and moved forward. At dawn on 20 November the advance began on Kuryat el Enab. The Regimental History described the attack thus "The attack on Enab was carried out by the 1/5th Somersets in front, the 1/4th Wilts in echelon in left rear, with 3/3rd Gurkhas on the left of the Wiltshires. The formation of the Somersets in this attack was No 2 and No 4 Companies in the front line, No 3 in support and No 1 in reserve. There was heavy driving rain as the troops moved forward and mist covered the battlefield, but with great dash the attacking waves advanced and completely drove the Turks from their positions in front of Enab. Getting in with the bayonet the Somerset men, though met by heavy machine-gun and rifle fire, were not to be denied and brilliantly carried first the defences in front of Enab and then the village at a loss of only two other ranks killed and nine wounded.... For two hours during the early morning of 21st the village of Enab was shelled heavily by the Turks and, owing to the congested state of the village - packed with troops and animals - casualties were heavy." On 21 November 1917 the 1st/5th Somersets and the 1st/4th Wilts were ordered to attack and capture the villages of El Jib and Bir Nebala, with a final objective of the village of Kutundia. The Regimental History continued "At 7am a combined force (consisting of a squadron of Hyderabad Lancers, the 1/5th Somersets, 1/4th Wilts and a section of the 230th MG Company) moved forward to attack and capture the two villages. The 1/5th Somersets led the advance and supplied two companies, under Captain Major, to form, with the Cavalry, an advanced guard. Progress was necessarily slow, as the country was rocky and precipitous in the extreme. The men, encumbered with full fighting equipment and with their boots cut and torn by the sharp stones, had to scramble down the rough hill-sides into a deep valley and then out again at the far end." The British attack continued on the next day 22 November, against El Jib. However both infantry divisions, were now in need of reinforcements, and unsupported by artillery, which could not get up the mountain tracks. Fighting for three days, but unable to break through the main Ottoman defensive position the attack stalled. After the hard fighting the attacking force had to withdraw. This fruitless day cost the life of one officer (leaving two Companies with no officers at all), 11 other ranks were killed or missing and 23 wounded. The Somersets' Regimental History continued "But the fighting was not yet over. After a bitterly cold night (it was the end of November, some 3,000 feet above sea-level and the men wearing khaki drill shorts and tunics with no blankets or greatcoats), the troops awoke on 23rd to acknowledge that El Jib was still to be taken. The 1/5th Somersets were detailed for the attack, and at dawn the Commanding Officer went forward with the Brigadier to obtain a view of the objective. Seen from the west, El Jib presented a formidable aspect. A natural stronghold, it stood upon a hill, about a mile to the east, with steep rocky terraces affording natural facilities for defence by enfilading machine-gun fire. The approach to the village was through a valley some 700 yards wide, with Nebi Samwil on the right, and, on the left, high ground and ridges leading forward from Beit Izza. The mosque on the lofty slopes of Nebi Samwil (see photograph below) which stood out in relief against the surrounding country, was occupied by the 3/3rd Gurkhas, who held on to their position most gallantly after desperate hand-to-hand fighting, in which even boulders were used by the defenders of the Mosque, in almost medieval fashion. At 8am the Battalion left the bivouacs.... The general plan was that the 1/5th Somersets should capture and hold El Jib.... the enemy was already busy, at this stage, shelling the northern slopes of Nebi Samwil from the direction of the Nablus-Jerusalem road, and as soon as the deployed lines of the Somersets came under observation, the Turks concentrated a heavy fire of shrapnel and high-explosive upon them. As the 75th Divisional Artillery had been unable to reach Biddu, there was no means of keeping down this well-directed and deadly fire. The attacking lines, however, moved forward with great coolness and precision, in spite of the intense machine-gun fire which opened on them as they came within range. No attack could live long under that fire. As one of the officers with the attack described it "every other man seemed to be falling.... it was terrible.... the lines just melted away." The machine-gun fire was coming not only from the El Jib position, where it was to be expected, but a particularly galling fire was also raking the attacking lines in enfilade from the northern slopes of Nebi Samwil on the right flank. Nothing daunted, what remained of the attacking lines pressed forward under intense and continuous fire. The fourth company, which had been held in reserve, was now thrown into the attack, together with any of the Battalion Headquarters who could be spared. The leading waves had now reached the foot of the rocky hill on which stood El Jib. Here they were faced by steep and almost unscaleable terraces which they endeavoured to climb. Three Lewis-gun sections managed to scale the terraces with their guns, and small parties of men actually reached the village itself. This was, perhaps, the most gallant feat of arms throughout the whole of the two-days operation, but, unhappily, it was a forlorn attempt, and none of those brave fellows were seen again. When El Jib was ultimately captured by the 74th Division, identity discs of 27 men of the Somersets were recovered in the position, which seemed to suggest that the men were shot down as they reached the upper terraces." It was now evident that a position of great natural strength could not be taken by an unsupported attack. Consequently the troops engaged were ordered to stand fast and the Somersets were withdrawn after nightfall, covered by the 2nd/3rd Gurkhas. The 1st/5th Battalion of the Somersets had gone into action on 22 November about 450 strong but had suffered 221 casualties in the two days' fighting - 3 officers killed and 6 wounded with 51 other ranks (including 31-year old Private Thomas Luxton) killed or missing and 161 wounded. Other Yeovil men killed in this battle were Frederick Wickstead, Fred Barnes, Wilfred Purchase, Harry Holland and Edward Bell. On 21 December 1917 the Western Gazette reported "Mrs Luxton, of Market Street, has been notified that her only son, Priv. 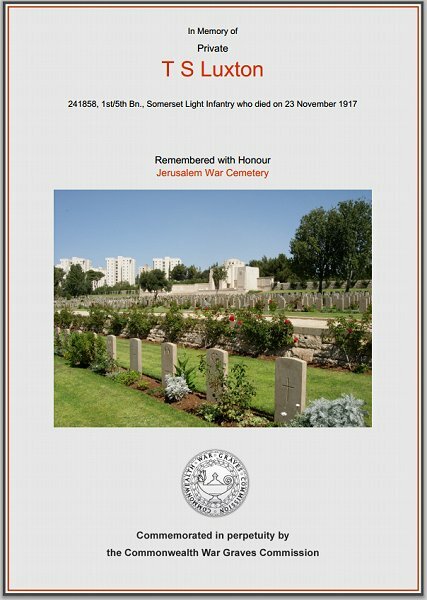 Thomas Luxton of the Somt.L.I., was killed in action on November 23rd. Private Luxton had been in the Army two years nine months, of which six were spent in Palestine. Deceased, who was 31 years of age, and was previously employed by Mr. Little, gunsmith, of Silver Street, was also engaged for several years as a packing assistant in the Western Gazette Publishing Department and agent for the Western Gazette for Preston and Montacute, leaves a sister and a widowed mother." Thomas Stephen Luxton was interred in Jerusalem War Cemetery (Grave G.26). His name is also recorded on the War Memorial in the Borough. The Commonwealth War Graves Commission certificate in memory of Thomas Luxton.